Late last year the Drop Box documentary film was released in theaters through Focus on the Family. There were limited show times available but we made sure not to miss this story of Pastor Lee who built a safe drop box for babies who would be abandoned on the streets of Seoul. If you haven't yet seen the documentary or are unfamiliar with this story, I heartily encourage you to watch this trailer for the film before you continue on with this review. Note: This film has since been released on DVD and I can only highly encourage you to watch it if at all possible. It will break your heart and make you cry - exactly what it should do - but don't be frightened away from it. Facing hard things is what God frequently uses to break our hearts and do great works in the world for His glory and for His name. Brian Ivie is not necessarily called to care for orphans directly, but he did have a passion for making movies and, as it turns out, God had a plan in that. 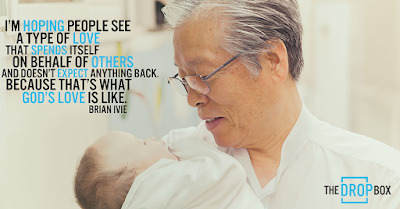 Interestingly, Ivie was not a Christian when he set out to tell this story. He was a film student who was looking to make a movie that would be compelling enough to be featured at Sundance Film Festival. Originally, Ivie went to S. Korea planning to show the contrast between S. Korea's preoccupation with plastic surgery and perfection and Dr. Lee's mission to save and provide shelter to disabled children. As he says, he went to Korea thinking that maybe he'd do a good deed by making a movie that would help save some babies or improve their lives. In the end though, he found that it was himself that needed to be save. Through this journey of making this film, Brian Ivie became a Christian. This book tells his story. In The Drop Box : How 500 Abandoned Babies, an Act of Compassion, and a Movie Changed My Life Forever Brian details his growing up years wherein he enjoyed making home movies with his friends. When he was in high school he knew that he wanted to make movies, although his parents were rather skeptical of his ability to make a living out of such a career. Nevertheless, he applied to and attended USC to learn about film. During his tenure as a student there he ran across an article in the paper about the drop box which caught his attention. Traveling abroad was popular at USC at the time so he thought he'd give a go at contacting Paster Lee and seeing if he could come to South Korea and make this documentary. Pastor Lee wrote him back saying that he wasn't quite sure what all the movie business was about, but that Ivie was welcome to come and live with him for awhile if he liked. He liked. "Even with nice parents and a nice house, I was an orphan in my heart. I was begging for people to love me, to approve of me, to want me. And what I learned is that when you're an orphan, even just in your own heart, you can love only those who will love you back. You can love only those people who have something to offer or who can reciprocate your feelings. I have to say that I think he accomplished his new goal - that of bringing glory to Christ for the work that He has done for each one of us on the cross. 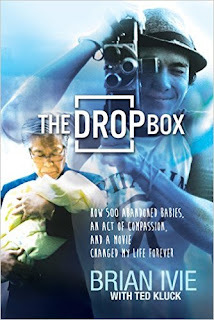 The book The Drop Box was an interesting read because it is the "behind-the-scenes" of the movie. From the perspective of the storyteller, you hear his own journey of how this film ultimately came to be and his story is indeed compelling. The writing style isn't exactly my preference, many parts being laid out as if they are scripts to movies to help the reader understand Ivie's personality and emotions a little bit better. I understand why that method of storytelling was chosen but it's not my favorite. 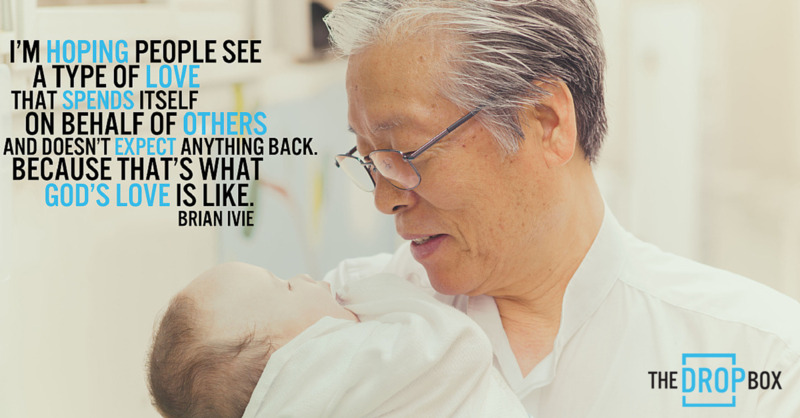 I was glad to hear Ivie's story but I have to say that Lee's is the one that nabs me. I would recommend the book to give a more complete picture of the film but if you were going to devote a few hours to something, I'd highly recommend the documentary over this book! Wow! I'd like to read that AND see the movie! Powerful stuff! May I share this on Facebook? Oh PLEASE DO! No need to ask!! I loved and was humbled by this movie. And the film makers story is just the icing on the cake to it. I didn't know he had a book out. I'll have to look for it.